The seven church of Revelation to whom Jesus dictated His letters are prototypes of the churches that exist today. 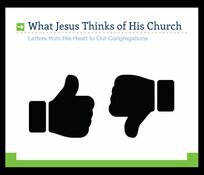 These messages are designed to help us evaluate what our letter would say if Jesus were to write his opinion of us! Here is rebuke, instruction, and encouragement. And, best of all, we are hearing these truths from the One whose opinion really matters! Great benefit was derived from John Stott's book What Christ Thinks of the Church when these messages were prepared.